Iris Dust is one of the stronger, more color-shifting Nubar duochromes. It can look like two completely different polishes depending on the light in which it's viewed. Plus, cool name. Iris Dust? Conjures up all kinds of cool images in my head. Nubar Iris Dust. See what I mean about it looking like two entirely different polishes? When I look at it head on, I see a purple polish with barely any visible duochrome. But change the lighting and BLAMMO! Whole new polish. It turns cool red / light burgundy with yellow, gold, orange and slight green duochrome. It can even look entirely yellow and green at times, too. Crazy, crazy polish. How many coats is this? Mine was very sheer, had to do 3 coats and it still didn't look like yours! Very pretty! Do you paint your nails a different color everyday? Nubar has the best duochromes! I think I have this stuffed in the back of one of my Helmer drawers. I'll have to remember to bust this baby open. So many untrieds. I saw this one on Nubar FB wall the other day and I was like OMG!! I NEED it! It's a gorgeous shade!! Nubar rocks!! This looks gorgeous, I love the duochromes Nubar makes. 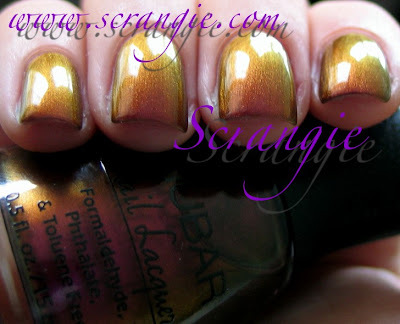 Gosh all of your Nubar polishes look so pretty! I am always like oooooh when I see a new swatch! You make me SO glad I ordered this. Stunning! Love this polish. I have it and love it. I'm partial to the name of Iris. I have a favorite cousin by that name. Also one of my favorite Spring flowers. My Mother used to grow masses of different varieties of them. Beautiful! It looks exactly like Rimmel's Zeitgeist! I am soooo happy I got this one! I don't think I'll ever get tired of duo/multichromes!! Okay. So... You are making me want to purchase every duochrome that Nubar has ever released, or even thought about releasing. This color is amaaaaaaazing!